Go is a programming language built by Google to resolve the issues that other popular programming languages such as C, C++, Java, Python etc,. Golang is built by the developers of B, Unix, C programming. Golang is an alternative name of Go programming language. It is the best option for Concurrency etc,. Yes and No. First, lets discuss why Golang is not Object Oriented because they there are no objects/classes in the Golang but there is something called struct in Golang which works similar to the objects. There is no concept of inheritance in Golang. You don't need any prior language to get started with Golang. You can directly get started with Go programming. 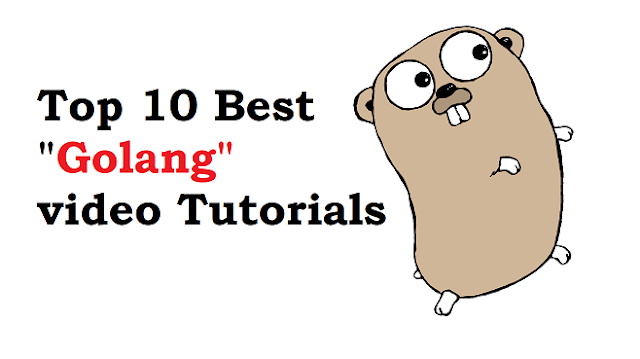 There are many programming languages to get started with Go (Golang) programming language but below are best resources to learn and master in Go (Golang) programming language. This is a popular video tutorial to learn and master in Go language. This tutorial gives you quick introduction to the Go programming language. The instructor explains the concepts step by step and provides a lot of exercises and good examples to make sure that you can get familiar with Go programming language. In this tutorial, the instructor explains about basic syntax and control structures, then explains about concurrency model, how to use packages, how to use Go runtime to build and compile projects, understand critical design decisions, etc,. I would recommend going through the Go language. This tutorial is best suitable for absolute beginners. This is another popular video tutorial that gives a comprehensive overview of Golang programming language. This video tutorial is very well structured in such as way that even a beginner can understand the concepts easily. The instructor starts explaining how to set up the environment to start coding the go programming language and then he shows how to create the first project using Webstorm. Then the instructor walks you through how to declare variables, data types, scopes, constants, memory address etc,. then the instructor shows how to work with control statements, functions, and data structures, interfaces, concurrencies, error handling etc,. The tutorial is best suitable for complete beginners. Gophercises is a great place to learn Go programming and get hands-on experience with the practice. Here, you will find many quizzes, exercises, assessments and already developed projects that really helps to get confident with Go programming. I highly recommend going through these videos. The instructor walks you through the in-depth concepts of Golang programming. In the tutorial, you will learn the fundamentals of web programming in Golang. The instructor covers all the required concepts to master in web programming such as explaining the Architecture of client-server model, how to manage States & Sessions, how to deploy a website and working with MongoDB, MySQL, AWS, Google cloud and building two real-world projects such as photo blog and twitter clone. etc,. Before going through this tutorial, you should have knowledge of Golang basics. It is recommended going through Learn How To Code: Google's Go (golang) Programming Language as the instructor covers basics of Golang. This video tutorial is a popular video tutorial on YouTube by Sentdex. n this video tutorial, the instructor walks through the quick introduction to Go Language Programming and then explains setting up and creating the first program using Go in a practical way. After that, the instructor explains how Golang working and how it can work for you. Then the instructor explains how to use syntax, types, pointers, structs, methods, pointer receivers, parsing XML, loops, how to add the Mapping news data, how to use templates, how to use Goroutines, finally, the instructor shows how to add the concurrency to the web app. etc,. The video tutorial is presented by the Tensor programming and in this tutorial, the instructor walks you two hello world apps and a static file server using Go. There are 17 videos in this playlist which helps to learn and understand the Golang. In this tutorial, you will learn basic fundamentals of Go programming language such as how to install Golang on Ubuntu operating system, how to add comments, how to declare variables, what are different data types, constants, arithmetic operators, if statements, switch statements, functions, arrays, structs, slice, pointers, typecasting etc,. This tutorial gives you an overview of the Go programming language and things that you can do with Go programming language. In this tutorial, the instructor covers all the important concepts such as variables, data types, pointers, functions, Branching, loops, Maps, Slices, and finally, the instructor covers concurrency concepts in Go programming language. This video tutorial is presented by Derek Banas and he is very popular on the YouTube for programming video tutorials as the content provided here is rich, professional and easy to learn for the beginners to learn programming. In this video tutorial, the instructor walks you through Go programming. It is worth going through this video tutorials. This tutorial is presented by Lucid programming and here, the instructor explains all the basic concepts of the Go programming language that helps master in Go programming language.